Join Brad Lancaster, author of the award-winning books Rainwater Harvesting for Drylands and Beyond (volumes 1 and 2), to celebrate the new edition of his book and to explore different ways to create an a natural abundance. Brad will share a diverse array of strategies to assess your on-site resources, maximize their potential, and empowers you with guiding principles to create an integrated, multi-functional plan specific to your site and needs. This dynamic presentation shares patterns and strategies to harvest, integrate, and enhance free local resources - such as rainwater, greywater, and stormwaters; sun, wind, and shade; and soil fertility, wild foods, and community fun - in a way that generates far more potential than the sum of their parts. Scarcity is re-visioned into abundance simply through creative cycling and utilization of what is already at hand. Costly and consuming habits and infrastructure, disconnected from their surroundings, are reoriented and reconnected to maximize enriching opportunities. You’ll see many examples of such transformation, including how once-dying wetlands and creek flows are being regenerated with simple hand-built structures made of on-site materials; how ancient sun- and shade-harvesting sites are informing passively heated, cooled, and powered modern homes and retrofits; and how once-blighted, overheated neighborhood streets are being rejuvenated into thriving greenbelts of water, people, wildlife, art, food, and celebration by planting once-drained stormwater, seed, and yard prunings. This talk is both an invitation for you to engage and partner with your natural surroundings and community, and a treasure map showing you the way—by planting the rain, dancing with the sun, growing shade, feeding the soil, sailing with the wind, and living as one of your community’s inspirational sparks! The talk will be followed by a book signing of Brad's new edition of Rainwater Harvesting Volume 1. Cost: Free. Donations welcome to cover the speaker's travel expenses. Brad Lancaster is a dynamic teacher, consultant, and designer of regenerative systems that sustainably enhance local resources and our global potential. 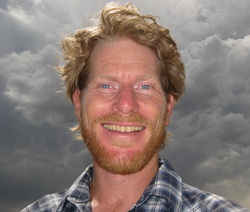 He is also the author of the award-winning, best-selling book series Rainwater Harvesting for Drylands and Beyond; the information-packed website www.HarvestingRainwater.com; and the 'Drops in a Bucket' Blog. Brad has taught throughout North America as well as in the Middle East, Asia, and Australia. His hometown projects have included working with the City of Tucson and other municipalities to legalize, incentivize, and provide guidance on water-harvesting systems, demonstration sites, and policy. He has likewise collaborated with state agencies to promote practices that transform local “wastes” into enhanced soil fertility. Brad’s aim is always to boost communities’ true health and wealth by using simple overlapping strategies to augment the region’s hydrology, ecosystems, economies, local food and renewable power production, citizens’ capabilities and cooperation, joy, and beauty. Brad lives his talk on an oasis-like demonstration site he created and continually improves with his brother and neighbors in downtown Tucson, Arizona. On this eighth of an acre and surrounding public right-of-way, they harvest 100,000 gallons of rainwater a year where less than 12 inches fall from the sky. In addition, the site’s sun-, wind-, and shade-harvesting systems power both Brad’s and his brother's homes, and help power those of their neighbors. Brad is motivated in his work by the tens of thousands of people he has helped inspire to do likewise, go further, and continue our collective evolution.